Discussion in 'Replica Props' started by propsculptor, May 20, 2006. Many of the film industryÂ’s leading animatronics artists and companies are lending to this exhibition, including Tom Woodruff, Jr. and Alec Gillis of Amalgamated Dynamics, Inc., the Jim Henson Company and the Jim Henson Legacy, Howard Berger of KNB EFX, Sony Pictures Studio, Tippett Studio, Walt Disney Studios, Universal Studios, Eric Allard, Rick Baker, Dave Barclay, Lyle Conway, Richard Edlund, Ray Harryhausen, and Robert Short. Films represented include 102 Dalmations, Alien3, Alien vs. Predator , An American Werewolf in London, Beetlejuice, Cats & Dogs, The Chronicles of narnia, The Country Bears, The Dark Crystal, Dr. Dolittle, George of the Jungle, Ghostbusters, Gremlins 2, Labyrinth, Little Shop of Horrors, Jurassic Park, Men in Black II, Mighty Joe Young, Mortal Kombat, Predator, Robocop 2, The Santa Clause 2, Short Circuit, Snow Dogs, Spider-Man 2, Star Wars and Willow. Thanks for the heads-up. I'll be there. but I knew anyone who's a fan of Movies would love this. YODA Will be there too. Just saw this on a muppet site and was going to post up. Would love to see some pics. 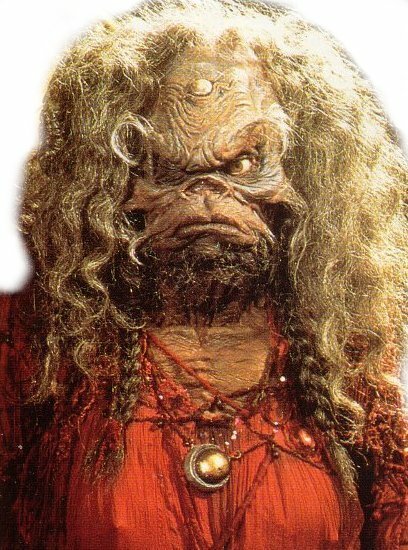 I'll post pics after I go to the exhibit,"The Dark Crystal's" Aughra will also be there..
Just saw the link on the make-up artist mag site, so bumping it for you LA folx.. Wish I could afford to come out, but i blew my budget going to C4..
Take pix if you can for us!